A hot topic in architecture circles is the current state of Pebble Beach Golf Links. The iconic course is one of America's best golf courses and is widely considered the top course that is open for public play. The current state of Pebble Beach is a far cry from its 1929 self, which many believe to be the best version of the course. As Sean Tully pointed in our recent podcast, the 1929 Pebble Beach was the product of Chandler Egan with help from Robert Hunter, Roger Lapham and Alister MacKenzie. The 1929 version of the course featured rugged bunkering, wider fairways, and massive greens. 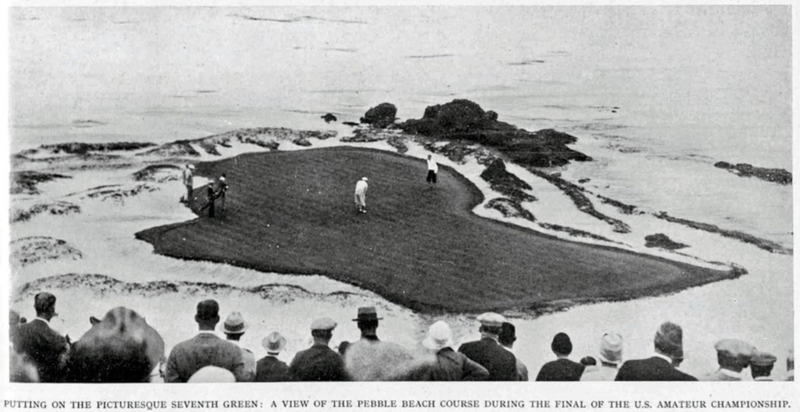 The 1929 version of Pebble Beach, pictured the 7th hole. A full restoration would force the course to shutdown and be costly. It would also have a major impact on the Monterey economy from a loss of taxes and resort guests. It's also debatable if Pebble needs to undertake a restoration. 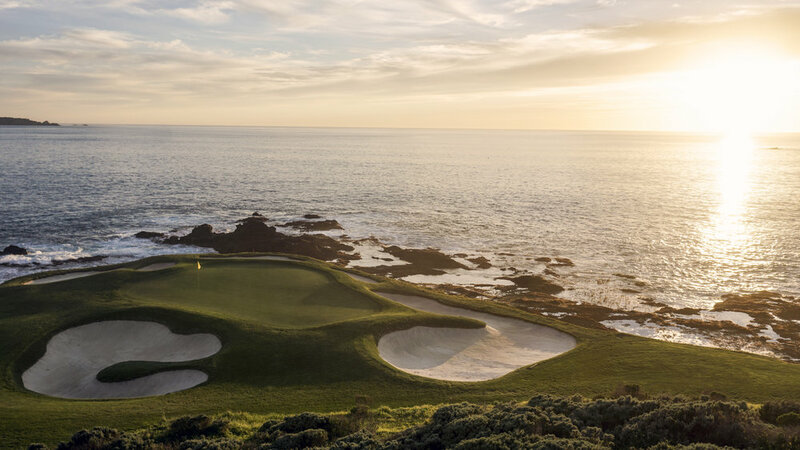 In its current state, Pebble Beach is booked all day, every day. To book an advanced tee-time golfers must stay at the resort two nights ($1600+) on top of the steep greens fee of $500. This is what makes restoration and year-long course shutdown unlikely. Pebble Beach can improve the aesthetic look of the course and improve playability without shutting the course down. One easy solution consistent with MacKenzie/Egan’s approach is to rid the course of its dissociated bunkers: A dissociated bunker is one positioned several yards off the fairway or green surrounded by several yards of rough. This disassociation provides a buffer that stops average shots from finding the intended hazard. To show how this would look and affect the course, I took a look at the most photographed hole in golf: the short par three 7th. It's a hole where the dissociation of bunkers from the green edge always sticks out. The 7th is a 111-yard par 3, a mere flip wedge for professionals. The green is tiny and has some nice bunkering, but it sits 3-5 yards from the edge of the green. For a professional to find these bunkers, it has to be extremely windy, or they have to hit an atrocious shot. What I would propose is expanding the green complex to push up to the edges of the bunkering and add short grass to some areas of the green surrounds. The larger green would afford tournament officials with more pin positions (an especially dicey back right one that seemingly floats in the ocean). Also, it would increase the playability of the hole for resort guests by having a bigger target. I would expect it to become more difficult for Tour pros who fire at flags with wedges because more balls would find the bunkers. This slider depicts how the expanded green would change from the tee. Over the past five rounds at Pebble Beach, professionals have found the primary cut of rough 35 times on the 7th. In comparison, they have found the bunkers only 22 times. A popular spot in the rough is between the flag and the bunkers where an overaggressive wedge shot from a Tour pro is stopped by the long grass. From the rough around the seventh in those five rounds, PGA Tour pros average a score of 3.14. The pros that found the bunkers surrounding the green averaged a score of 3.5. Note: During last year's windy conditions in the first and second round six balls found the fescue grass. These shots were omitted from the above results. A popular spot that tour pros miss is long and left of a back left pin. It's a spot that I would propose adding short grass. The short grass would propel over-aggressive shots further away from the green, leading to a more difficult recovery for Tour pros. Meanwhile, the resort guest would be able to putt their way onto the green from this area. How I propose to expand the green and add fairway grass. The seventh hole isn’t alone, the vast majority of greens at Pebble Beach are a fraction of their intended size. This limits the effectiveness of the course's bunkers, reduces the possible pin positions and makes the course more difficult for the resort guest. For the pros, more shots would find hazards on trickier pin positions. For resort guests, there would be larger greens and fairways. Guests would be putting more - which should enhance the experience rather than hitting tricky chips shots from the rough. Most importantly, the course would play closer to its initial intention - rather than the current “target golf” model. Full restoration to 1929 should be the long-term plan for Pebble Beach. In the meantime, fixing the mow lines would go a long way to making Pebble more interesting and fun for professionals, resort guests, and viewers.